The Abbe‘s protests of innocence fell on deaf ears considering his history of degeneracy — thefts, seductions, even firing his own parsonage for the insurance money — stretching back to his seminarian days. He’d been condemned for killing that January at Entrammes another priest, Abbe Fricot — whose body had wound up plundered of valuables and dropped down a well. This epidemic of priest-on-priest violence made for a tremendous public sensation that certainly was not conducive to Bruneau’s efforts to defend himself. Once he became suspected of Fricot’s murder, he was also baselessly implicated in (though never charged with) the unsolved killing of a Laval florist from the previous year. 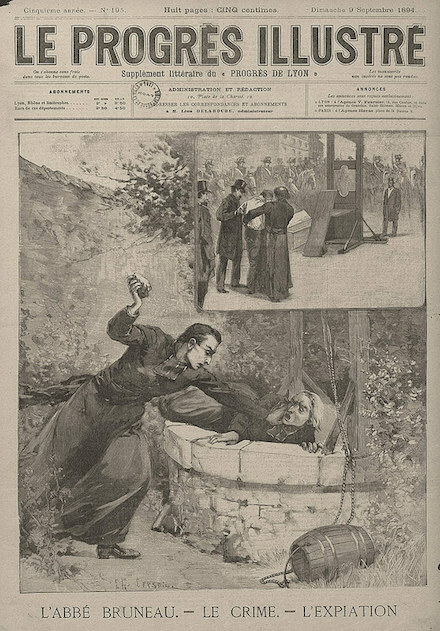 A thread on guillotine.cultureforum.net draws our attention not only to some wonderful original reportage but to the riveting first-person account of Henri Massonneau in his Devant l’Echafaud (In Front of the Scaffold, available free online from Google Books or Gallica). Massonneau recounts the fury in Laval, where crowds expecting the execution a couple of days previously pelted the prison with taunts for the condemned man. 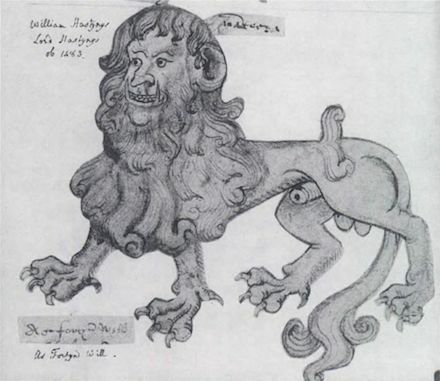 In the night spots around the city, Massonneau even heard patrons grumbling for the head of Bruneau’s barrister, for having dared to defend the monster. The magistrate and energetic proto-true crime scribbler Pierre Bouchardon* took up l’Affaire de l’Abbe Bruneau in 1942 and thought the legal proceedings inexcusably slipshod owing to the prejudicial atmosphere. 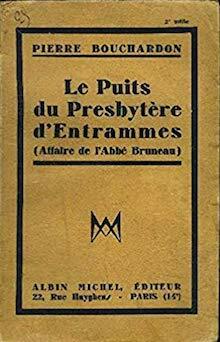 (Unfortunately his Le Puits du Presbytere d’Entrammes (The Well of the Presbytery of Entrammes) falls under the pall of copyright and must be hunted among sellers of antique francophone titles.) Many other retrospectives have reached a similar conclusion. At half-past two in the morning, the van carrying the guillotine arrives, escorted by six gendarmes, at the Place de la Justice. This square is planted with tall trees and surrounded by stone terminals connected by chains. To allow the van to enter the square, the chains at the extreme angles had to be sawed. The square has been evacuated, but the windows of the neighboring houses are full of curiosity, and the square of the Cathedral which opens directly on the place du Palais de Justice, following it, is black with people. We will attend the spectacle. But there will not be gladiators fighting wild beasts, nor bullfights, nor athletes measuring themselves: it will be the law that will kill an unarmed man. There are men, women, children, bourgeois, farmers, workers, many priests. Kids have climbed into the trees. We can not dislodge them. There are six thousand people around the guillotine. It’s a grand success. The weather is superb, the night is even hot. From a distance, the crowd follows the assembly of the guillotine. When the sinister machine stands up, erect in the night, joy breaks out. We are finally quiet: Bruneau will be executed. The hour passes. My colleagues and I are entering the prison, but we are numerous and the Prosecutor of the Republic informs us that we will not be able to enter the cell of the convict. We will have to wait for him in the chapel where he will come to hear his last mass. From that moment, we will not leave him. He put on his pants. The prosecutor asked him if he had a confession to make. “No,” he replied, “I am innocent, not only of the crimes for which I was acquitted, but also of the one for which I was condemned. I only committed indecent assaults. I am innocent.” He delivered a letter to the Prosecutor. In this letter, Bruneau again protests his innocence and says he forgives those who have hurt him. The letter was not published. Despite claiming to forgive them, Bruneau leveled slanderous accusations against some witnesses of the trial. I go down to the chapel. It is located in a basement. From the chandeliers, a dozen candles flicker a dim light. Soon the chapel is full of people … I have never seen a scene more moving than the appearance of Bruneau in the chapel. He has come down at a brisk pace the twenty steps that lead to it. He wears his beard, very black, which gives him a remarkably energetic appearance. His foot scarcely leaving the last step, the condemned stiffens, and with a sudden movement turns towards the holy water font. His arms are shackled and he must make an incredible effort to take holy water. He looks like an automaton. He crosses himself, not without difficulty, then with a sure step approaches the high altar. There, he drops to his knees. A thump sounds. Bruneau seems lost in a chasm of prayer. The chaplain approaches him and speaks to him in a low voice; Bruneau resumes his prayer; the chaplain comes to ask the prosecutor for permission to isolate himself with the condemned man to hear his confession. The prosecutor hesitates, but consents in the end. The chaplain returns near Bruneau, helps him get up, and they both head for a corner of the chapel hidden by a curtain. They disappear behind it. Two guards come to stand near the curtain. The confession lasts ten endless minutes. Finally, Bruneau comes to take his place, on his knees, in front of the maître-hôtel. And the mass begins. Another twenty minutes pass. The assistants suffer visibly for the convict throughout; Bruneau communes. Finally the ceremony is over. Bruneau, before going out, again takes holy water, and he has the same difficulties as before. He is very calm. He climbs the stairs without weakness. It feels like a man walking in a dream. From the chapel, one goes into the courtyard to go to the registry where the last toilette is to be made. It is a small room on the ground floor. Through the door, left open, I attend these funereal preparations. Quietly, without affectation, he says he is hungry. It’s a new delay. Priests usually eat immediately after communion. It is habit that he is hungry. Bruneau is near the scaffold. It is exactly 4:47. Legally, indeed, it is at 5:15 that the execution should have taken place. We are half an hour ahead. Bruneau has crossed without faltering the two hundred meters that separate the prison from the scaffold. Contrary to all the condemned, he does not want to see the guillotine. Two meters from the bascule he turns his head with affectation so as not to behold it. The chaplain presents him a crucifix. Bruneau kisses it twice, then he drops into the arms of the chaplain and kisses it for a long time. The executioner’s assistants seize him but he tears free with a sudden movement and turns to the chaplain begging again to kiss the cross. He can not take his lips off the crucifix. The chaplain speaks to him, exhorts him to courage, and with a movement of exquisite gentleness pushes him towards the assistants who seize him and precipitate him onto the bascule. When Bruneau entered the Palace Square, a huge “Ah!” came out of the crowd. But once he is here, we hear no sound; no word is uttered; nobody budges. Bruneau’s struggle against death at the foot of the scaffold lasted two minutes, two centuries. The knife falls. Society is avenged. Its representatives on the Cathedral Square record this victory by frantic applause. It is interminable, already, the head is thrown in the basket with the body, the basket in the van, and the van rolls towards the cemetery. The crowd is still clapping. By the Place du Pilier-Vert, the Place des Arts, the Rue Neuve, the Pont-Neuf, the Rue de la Paix, in ten minutes the convoy arrives at the cemetery, between two curious hedges. Since three before days the pit was dug and the coffin was waiting. Bruneau is buried at the end of an alley on the right, in the section of mass graves. 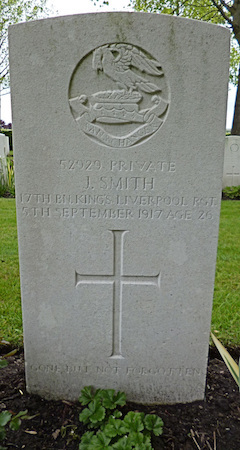 The following year, passing Laval, I went to the cemetery. I found in front of the tomb two kneeling nuns who were praying. Many people, indeed, in the religious world, did not believe the culpability of Bruneau. 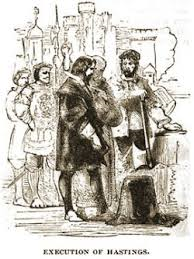 But it is incorrect, as has been said, as I myself reported then, that the bishop of Laval made every effort to obtain pardon for the condemned. The bishop of Laval was stricken with immense sadness when Bruneau’s crimes were discovered. He cried, remained silent, and died of sorrow. * Most famously, Bouchardon prosecuted Mata Hari. On this date in 1594, Thomas Merry (Merrey, Merrye) and his sister Rachel were executed at Smithfield — Thomas for the robbery-motivated bludgeon murder of their neighbor Master Beech, and (too-)loyal* Rachel as an accessory to it. No original record of this case survives, but we have its date from a registry record of one of the numerous now-lost ballads about the case, The pitifull lamentation of Rachell Merrye, whoe suffred in Smithfield with her brother Thoms Merrye the vj of September 1594. What hast thou sped? have you bought the bag? I brother, here it is, what is’t to do? To beate hence Beeches body in the night. And ’tis no trusting of another man. And throw it into Paris-garden ditch. Ile move the Fagots that do cover him. Of his disseuered blood besprinckled lims? I mary can I fetch the chopping knife. This deed is worse, then when you tooke his life. Better do thus, then feele a greater woe. This barbarous deed of inhumanitie. Merry begins to cut the body, and bindes the armes behinde his backe with Beeches garters, leaves out the body, covers the head and legs againe. If we credit the play — and it’s the only source in town — poor Master Beech ended up hacked into many pieces that were secreted in various places around London as a ploy to avoid detection. We would be remiss on a site such as this not to spare a peep for the actual execution scene. We pick it up with Thomas Merry already standing upon the ladder with the hemp about his throat, exhorting his sister to firmness. We shall be crown’d with immortallitie. Christ is of power to helpe and strengthen me. I pray make hast, the hower is almost past. Receive me God, for now I come to thee. Turne of the Lather: Rachel shrinketh. Nay shrinke not woman, have a cheerefull hart. Will be rebellious gainst my willing spirit. Although they seeme the staires of infamie! Which turne away great God, for Christes sake. More bloody deeds of like deformitie. And see his presence everlastingly. To Mile-end greene, and there be hang’d in chaines. 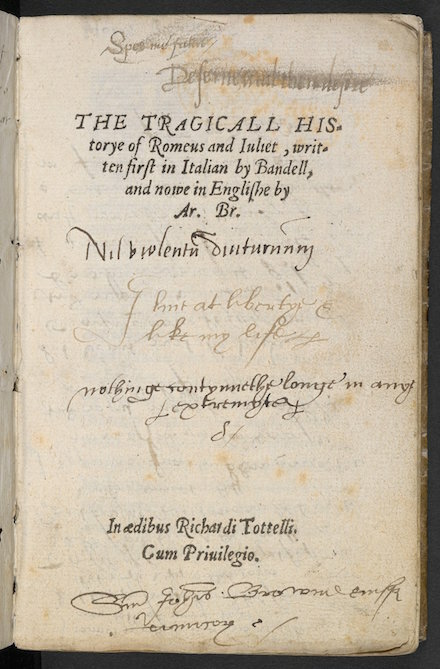 ** There’s yet another known play about the case from 1599, also lost. † This play strangely cuts back and forth between the action in the titular two tragedies, which are the Merry crime and a fictitious murder set in Padua — the whole thing scaffolded by a chorus of narrator-allegories comprising Homicide, Avarice, and Truth. The Italian story also ends in a pair of executions. On this date in 1828, a young printer’s assistant morally corrupted by the theater went to the gallows at York, Upper Canada (soon to become Toronto, Ontario). After boozing it up at a performance of Tom and Jerry, or, Life in London* at Frank’s Hotel, 21-year-old Charles French fell into a drunken row with Edward Knowlan or Nowlan and shot him dead, in a case that occasioned a local moral panic about the dangerous carousing nurtured by the nightlife in the small frontier town. Frank’s Hotel, York’s very first theatrical venue, was “neither under order nor restraint,” French’s respectable parents pleaded in their unsuccessful clemency missive. It was “the haunt of the gay and dissolute, the idle and the profligate, the ruffian and woman of bad fame, those who show in the light of the moon were there — and from its temptations few parents or masters could restrain the youth.” (Source) Theater troupes were banned from York stages for five years after the French affair. 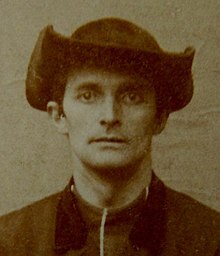 French’s defense had likewise attempted to raise doubts about his mental competency, and although this worked as well as it usually did in a 19th century courtroom there was no small sentiment for French’s reprieve: (K)nowlan was a notorious goon, and the circumstances of the fray seemed muddled enough to bring the shooter’s degree of calculation into question. Two alleged accomplices, acquitted in separate trials, swore that Knowlan had menaced French before French shot him. The close clemency call carried a sharp political undertone. 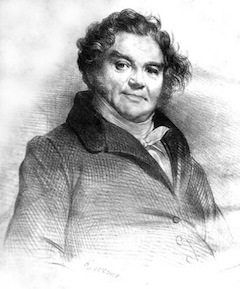 French was an understudy of the reform publisher William Lyon Mackenzie and his victim a Tory brawler who dealt out bruises in the service of Upper Canada’s “Family Compact” ruling clique. That his petition for mercy was rejected by Lt. Gov. Peregrine Maitland eventually became one of the (lesser) briefs against the Family Compact advanced a decade later during the Upper Canada Rebellion. * The period’s several Tom and Jerry plays — no overt relationship is known between them and the 20th century Tom and Jerry cartoons — derived from Pierce Egan‘s smash hit Life in London, or, the day and night scenes of Jerry Hawthorn, esq., and his elegant friend Corinthian Tom in their rambles and sprees through the metropolis. The title characters capture vignettes around the city, naturally not excluding the condemned hold at Newgate, which they tour with their friend Bob Logic on the pretext of consoling one of Logic’s old friends. An opportunity presented itself to our TRIO to visit the Condemned Yard in Newgate. “It was a mournful sight,” Logic observed to the Corinthian; “but as it was the intention of Jerry not to neglect visiting any place that might afford him information during his stay in London, he had been induced to make the proposition to Hawthorn; yet, he was free to confess, it was more especially on his own account, as he was compelled to attend, and companions would, therefore, prove very agreeable to his feelings upon such a melancholy occasion.” “We will accompany you, Bob,” replied Tom and Jerry. That summons thee to heav’n or to hell. The Condemned Yard is long, but narrow, and contains a great number of cells, one above another, forming three stories in height. Each cell measures nine feet in length, and six in width. [Compare with Dickens’s description -ed.] Every indulgence is allowed to those prisoners immediately the “death-warrant” arrives at Newgate, ordering them to prepare for execution. They are then allowed to remain in the Large Room (which the Plate represents), in order that the Clergyman may attend upon them as often as they desire it, and who, generally, previous to the morning on which they are to suffer, sits up praying with them the whole of the night. It is really astonishing, upon most of these occasions, to witness the resignation and fortitude with which these unhappy men conduct themselves: many of the most hardened and desperate offenders, from the kindness, attention, and soothing conduct of the Rev. Mr. Cotton, who is indefatigable in administering consolation to their troubled minds, have become the most sincere penitents; nay more, several prisoners, who have received a free pardon after having been ordered for execution, have since publicly declared that they should never again be in such a fit state to meet eternity. The criminal on the left side of the Plate, lifting up his hands in the attitude of prayer with the Clergyman, was once a character of considerable note at the West End of the Town, and from his vivacity, then designated “Lively Jem!” He soon ran through a fine fortune; and, to keep up his extravagances, he plunged into those destructive habits which ultimately brought him into this ignominious situation. Lively Jem, like most others, saw his error too late to repair it. He had not strength of mind sufficient to bear with the reverses of fortune; to fall from splendour to poverty was too much for his feelings; and, to avoid the jests and sneers of his once dashing acquaintance, under the appellation of “poor fellow!” and being excluded from their company, he thus violently terminated his thoughtless career. Jem had been at college with the Oxonian, and as his last request, lie had sent a message to Logic to attend upon him on this mournful occasion, in order to be the bearer of some important circumstances respecting himself to a female, to whom he had been very much attached, and who had also never been absent from him except this fatal morning. 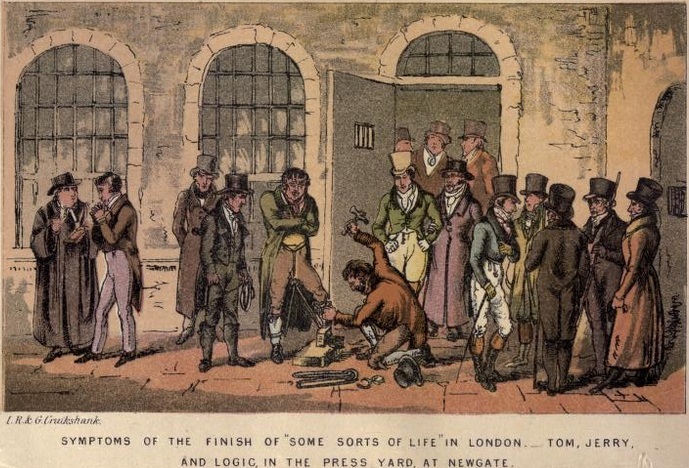 Logic was too much of a man to neglect another in the hour of misfortune; and it was to fulfil the request of a dying unfortunate acquaintance, that he came, accompanied by Corinthian Tom and Jerry, to the condemned Yard of Newgate.